I love teaching the Spanish class at our homeschool co-op. It’s an enrichment class, so we are just learning for fun. We made Spanish valentines to deliver to family. We also learned important family vocabulary. Here are some of the things we learned as we prepared for Valentine’s Day in Spanish class. First, we learned how to say the names of some family members. Some of course are frequently used already, but those cousins and aunts and uncles were not on the top of the mind for most of the students. It’s always good to review family member vocabulary. I made a simple review game on cute hearts. We also had a review and practice for conjugating “ser” so we could tell our loved ones some compliments. Ser and Estar are difficult, but at least we could review ser by itself as we formulated some compliments. I also made some “conversation hearts” and we learned the vocabulary on them. Then we made Valentines for our loved ones! I especially loved how the youngest of kids made Spanish valentines for their mothers. The older (fourth and fifth grade) boys were not keen on making anything. At any rate, it was a ton of fun to practice using our limited Spanish to do something so practical! 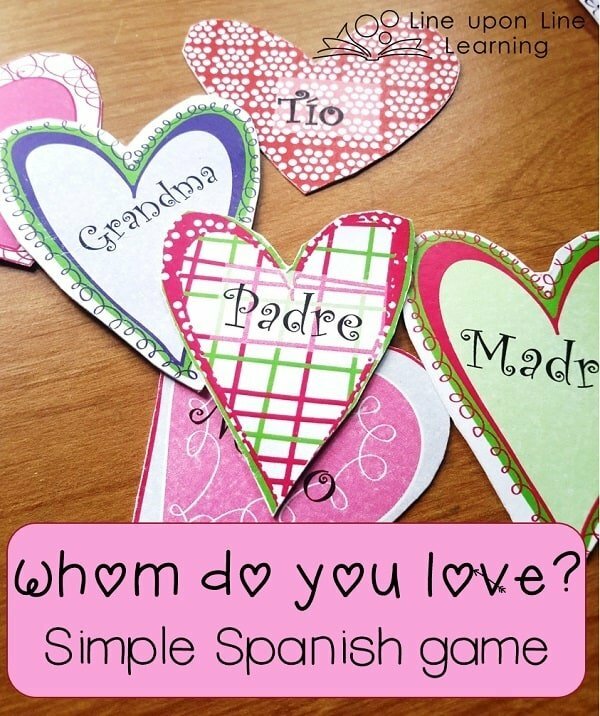 Here is the Valentine’s Day Spanish class activity! It has a vocabulary page, filled in conversation hearts, blank conversation hearts, and the family members heart matching game. You can get it at my shop or at TeachersPayTeachers.